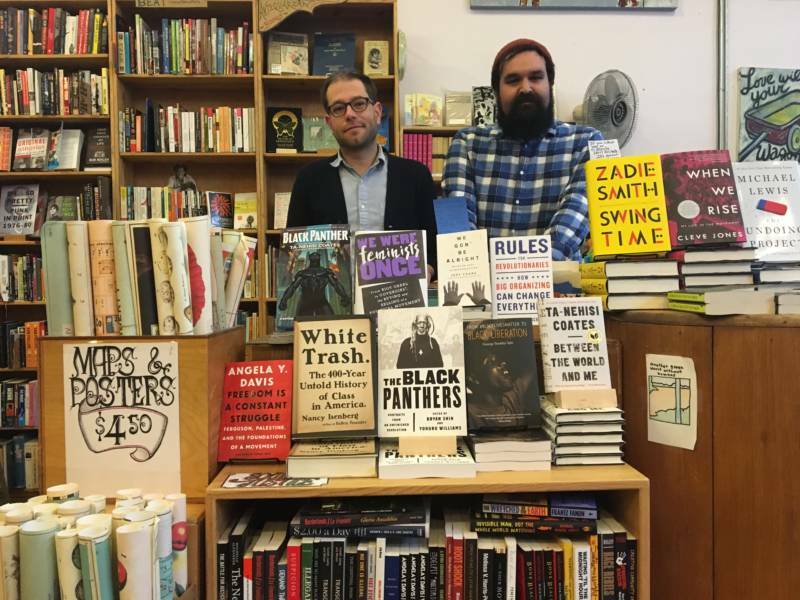 Thanks to the election of Donald Trump, Dog Eared Books in San Francisco has a whole new section. It's right up front and filled with books about social justice. Dan Weiss, head buyer of new books for the store, created the section the day after the election. It has books about rural white America, like Arlie Russell Hochschild's "Strangers in Their Own Land," and ones about activism, like Angela Davis’ "Freedom Is a Constant Struggle." Other bookstores, like City Lights and Alley Cat, have created similar areas and have similar books. Weiss said he also wanted to feature books that give some political and social insights into what is happening in America. People told him again and again about one particular book, "The Origins of Totalitarianism," by Hannah Arendt. He ordered it, and the book immediately sold. Copies have been flying off the shelves ever since. Other books have seen a spike in sales after Trump’s election. Titles about the white working class and rural America have done particularly well -- books like "White Trash" by Nancy Isenberg and "Hillbilly Elegy" by J.D. Vance. "Hillbilly Elegy" started selling three times as fast after the election, according to the book's publisher. As of Jan. 18, it was once again on top of the New York Times hardcover nonfiction best-seller list. But these books are new and intended for a popular audience. They were already selling well before the election. "The Origins of Totalitarianism," not so much. Weiss said Dog Eared Books usually sold just a few copies a year and often bought the book on publisher overstock or remainder. "The Origins of Totalitarianism" is a dense tome of political theory published in 1951. In over 500 pages, author Arendt details the elements in society that led to the rise of Stalinism and Nazism. The book is not typically a hot commodity. But by mid-December, many Bay Area bookstores were sold out. Even Amazon briefly ran out of stock. Jim Milliot, editorial director of the trade magazine Publishers Weekly, said demand for Arendt’s book started to rise right after Trump's election. Milliot said about 50 copies of "The Origins of Totalitarianism" normally sell nationally each week, according to data from Nielsen BookScan. When sales of the book peaked in December, it was selling at 16 times that rate. Milliot said these are very good numbers for a decades-old book of political theory. He added that the surge in demand was not some holiday bump -- December 2015 saw no surge in sales. Milliot said this isn’t the kind of book someone would normally give as a Christmas present. Roger Berkowitz, founder of the Hannah Arendt Center at Bard College, is both shocked and heartened by the sales numbers. Berkowitz said he’s never seen so much interest in Arendt’s work. There have been articles about her writings in the New York Times, the Washington Post, New York Review of Books and a host of other publications. Berkowitz is starting a virtual reading group open to the public on Friday to tackle "The Origins of Totalitarianism," and people are signing up at an unprecedented rate. Berkowitz says it makes sense that people are turning to Arendt now, because the right-wing populism and dissatisfaction with government sweeping through Europe and the U.S. is reminiscent of what happened in the 1920s and '30s in Nazi Germany and Communist Russia. Arendt wrote about how these conditions open the door for totalitarianism, a political system in which the state has complete power and establishes a single ideology that people follow en masse. Arendt investigated how, once that kind of mass movement begins, individuals no longer accept rational arguments that contradict their ideology. She wrote that they will sacrifice even their own well-being to preserve a movement that has become the central thing that gives their lives meaning. Trump started a movement with some unsettling characteristics, Berkowitz said -- like how the campaign handled facts -- but that Trump is no totalitarian. He said we should not exaggerate the comparison between now and the 1920s and 1930s. 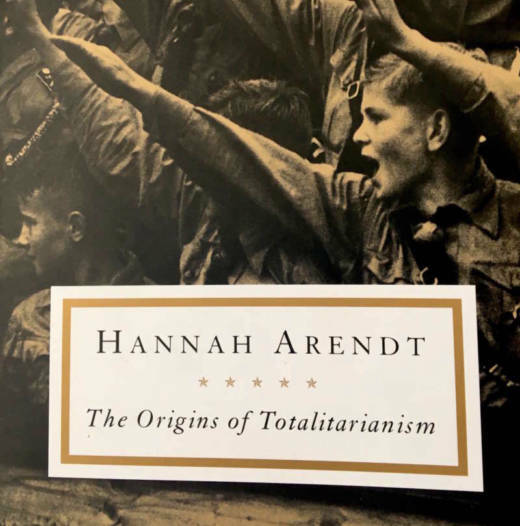 Berkowitz said some of the interest in this book today undoubtedly, and perhaps unfortunately, comes from the title, "The Origins of Totalitarianism," which may seem to promise answers to readers. Berkowitz said Hannah Arendt actually did not like the title, which came from the publisher. She didn’t think you could pinpoint the origins of totalitarianism because of the messy complexity of the world. Berkowitz said the book gives readers the analytical tools to see the elements in society that increase the potential for totalitarianism, like loneliness and the isolation or "atomization" of individuals. Arendt originally wanted to call the book "The Burden of Our Times." At Dog Eared Books, Dan Weiss said readers are feeling uncertainty about the future, and they're searching for a way to understand it. That's one reason they're buying challenging books. “People are feeling more commitment, I think, to read things that are difficult right now than they would have before,” Weiss said. But some customers are coming in because they want to steer clear of the real world altogether. Since the election, Weiss said, the store has sold quite a few science fiction novels.